A cat’s claws are an integral part of who she is. 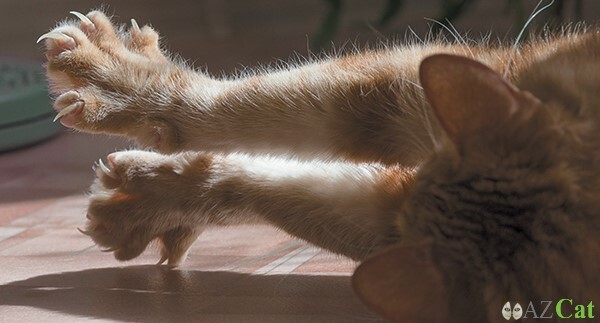 Cats are exceptional hunters, excellent climbers and specialists in personal defense—thanks in great part to their unique protractile (extendable) claws. They also use their claws as social signaling instruments, leaving messages on surfaces to tell other cats where they frequent. Although an indoor cat doesn’t need to use her claws to hunt, will probably never need to defend herself and may have no other cats around to leave messages for, her claws and their care will still inﬂuence her natural behavior. Because her claws grow in layers, she’ll frequently feel the need to sharpen them against coarse materials to remove the worn and fraying outer layer. In addition, she’ll use her claws in play, often extending them but purposely inhibiting the precision of her paw swipes. Unfortunately, while this use of her claws is natural, normal behavior for a cat, it can create certain problems for her pet parents. However, scratching and other claw use in cats is much easier to manage than most people realize. You can teach your cat to direct her scratching toward appropriate targets. You can also use plastic caps on your cat’s claws ( Click Here : Soft Claws® ). However, a simpler and easier solution is to regularly trim them yourself. Although the thought of trimming your cat’s claws may be intimidating, if you do a bit of preparation in advance, proceed slowly and follow the guidelines below, the procedure can be relatively trouble-free and painless for everyone. Some people declaw their cats to prevent or resolve a scratching problem. The term “declaw” is a misnomer because it implies that only the claws are removed. In reality, declawing ( onychectomy ) involves 10 separate amputations of the last bones of your cat’s toes—including nerve, joint capsule, collateral ligaments and the extensor and ﬂexor tendons. Cats suffer signiﬁcant pain while recovering from these amputations. An alternative surgery, a tendonectomy, severs the tendons in a cat’s toes so that she’s unable to extend her claws to scratch. This procedure is also very painful for a cat. In addition, if you choose this type of surgery, you must clip your cat’s claws regularly because she’ll be unable to maintain them herself. The ASPCA discourages both declawing and tendonectomies because of the extreme pain these surgeries cause. Both procedures are illegal in some European countries because they’re considered cruel to animals. We only recommend such surgeries if a cat caretaker has unsuccessfully tried everything else to resolve scratching behavior and is considering euthanasia. The best approach to teaching your cat to accept having her claws trimmed is to begin while she’s still a kitten. If you begin early, she’ll grow up accepting nail trims as an enjoyable part of life with you. In addition, kittens often haven’t mastered use of their claws, so they beneﬁt greatly from regular trimming. Rest assured, teaching your cat to accept having her claws trimmed is an obtainable goal. What’s required is patience. Plan on taking at least a month just to familiarize your cat with having her paws and toes handled. Depending on her personality, your cat may learn to accept having all her paws done in one sitting, just one paw at a time or just a couple of claws at a time. You’ll be most successful if you don’t expect to trim more than a couple of claws in one sitting. The best time to trim your cat’s claws is when she’s relaxed or sleepy. Never try to give a pedicure right after a stressful experience or an energetic round of play. How to Trim Your Cat’s Claws? What special treat you use depends on your cat, but many cats get quite excited about bits of tuna or vacuum-sealed salmon, cooked chicken liver or smelly cheese. Test a variety of treats to see which two or three your cat prefers. Once you‘ve decided which treats you’ll use, reserve these for nail trimming only. Whether your cat is an adult or a kitten, the ﬁrst step is to familiarize her with having her paws handled. Teach her that having her paws handled results in her getting delicious treats. Never trim where your cat can view birds or other wildlife. Never trim in the presence of other cats or pets. Never trim by a window where outdoor cats may pass. Never trim after a bout of play. Never trim if your cat has recently—in the last three to four hours—had an altercation with another animal or has been frightened in any way. Once you’ve chosen the place where you’ll do the trimming, sit with your cat on your lap facing away from you. If your cat likes to be petted, stroke her a bit. However, if your cat doesn’t like to hold still for very long, don’t pet her. If you’re right handed, take one of your cat’s front paws between the ﬁngers of your left hand. Gently take her paw between your index, second ﬁnger and thumb, and begin massaging. Massage for no more than the count of three. If your cat tries to pull her paw away, don’t react by pinching her or pulling on her paw. Instead, follow her movement and simply keep your ﬁngers in contact with her paw. After counting to three, gently press the pad of a toe enough to extend the claw. Count to one, release your cat’s paw and immediately give her a treat. Repeat these three steps four more times during this session. Pay attention to how your cat reacts and whether she eats the treats readily. If she begins trying to pull her paw away from you, next time hold her paw for a shorter count—even for just one second—before extending her claw and giving her the treat. Work with your cat every other day or every third day, handling a different toe each session until you’ve worked with every toe on one of your cat’s front paws. Once you’ve handled all the toes on one paw, work to familiarize yourself with your cat’s claws. Bring the clippers, your special cat treats and your cat to your quiet claw-clipping chair. Hold your cat in your lap. As before, take one of your cat’s toes in the ﬁngers of your left hand and begin massaging. Gently press her toe pad enough to extend the claw. With the claw extended, look for the pink part of the nail, called the “quick,” which contains nerves and blood vessels. When you begin trimming your cat’s claws, you’ll avoid cutting near the sensitive quick. Nicking the quick is painful and will cause bleeding. Blood ﬂow can be stopped by applying a styptic material (sold as powder or in stick form). It’s always a good idea to have this on hand when you start clipping your cat’s nails, just in case you make a mistake and cut the quick. Release your cat’s toe and immediately give her a treat. Bring the clippers, your special cat treats and your cat to your quiet claw-clipping chair. Gently take one of your cat’s paws in the ﬁngers of your left hand, and press a toe pad enough to extend the claw. Note where the quick is. Position the clippers with your right hand about halfway between the end of the quick and the pointed tip of the claw. You‘ll trim just the sharp tip off the nail. Once you’re comfortable that your cat accepts trimming, you can clip a bit more of the nail—although you should never clip right next to the quick. Release your cat’s toe and quickly give her a treat. If your cat didn’t seem to notice the trim, do another nail. Don’t attempt to do more than the tips of just two claws at one sitting until your cat is obviously comfortable with trimming. Do not cut too close to the quick. Do not try to do all the claws at once. Do not trim when you’re upset or your cat’s agitated. Do not yell at your cat or attempt to punish her in any way.